Once any type of food/drink with any caloric content is eaten, it will eventually be broken down to glucose in the blood. That glucose is transported in the blood to certain tissues to be used as energy. Insulin is the the main hormone that determines the glucose concentration in the blood by pushing the glucose out of the blood into an organ to be used as energy. Insulin is produced by the a portion of the pancreas called the Islet of Langerhans. The pancreas is an gland located behind the stomach and within the pancreas are beta cells. These beta cells produce insulin in the right amount and at the right time to keep blood sugars normal. When a person eats, another hormone made in the gut called GLP-1 helps the pancreas release the right amount of insulin to move sugar from the blood into the body's cells. GLP stimulates the beta cells of the pancreas to release insulin when blood sugar is too high and it helps to lower the amount of sugar made by the liver. There is a third hormone called glucagon which instructs teh liver to release stored sugar if blood sugars become too low when a person has not eaten or overnight. In fact, there is about 4 days of stored sugar in the liver in the form of glycogen. 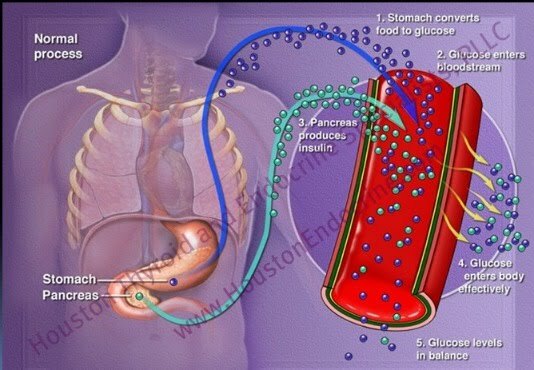 In the figure below insulin is represented with key and facilitates the movement of blood sugar from the blood into a target organ such as the muscle. The insulin receptor is represented by the door in the below figure. Glucose is generally unable to be used as energy unless insulin is present. In this figure insulin is represented with a green key, glucose molecules are the blue dots, and the red blood cells are the red ovals. A fasting blood sugar less than 100mg/dl is considered normal. Anything above that is abnormal and possibly related to some form of diabetes mellitus.